MotorWeek’s Joe Ligo explains that the model only existed for the 1987 model year, and that only 1,035 Regal Limited Turbos were ever made. Good year. I was new for ’87 myself. This car was powered by the same 3.8-liter V6 turbo LC2 engine that made the Grand National famous, got some sporty wheels and black exterior trim, and the cockpit looks like the inside of a coffin. Or, you know, what passed for opulence from General Motors 30 years ago. [I]n 1987, the lightweight WE4 (turbo-T) option arrived. The turbo-T slotted between the Grand National and the famous GNX (Grand National Experimental) in the Regal lineup. The differences between the cars amount to interior styling, wheels, exterior badging, aluminum bumper supports, and aluminum rear drum brakes. But swapping in the aluminum for the heavier cast iron made the WE4 turbo-T lighter and faster. It had no electric windows or seats, just power locks and—surprisingly—air conditioning. The Limited Turbo also has a hood ornament, which of course is not you’d expect on a menacing Grand National, let alone the wilder ASC/McLaren-tuned GNX. So basically, this thing is a Buick Grand National powertrain without the dramatic aesthetic. Or, a regular Regal with a sweet engine. The total package makes for pretty much the perfect sleeper, and I’d say that’s as true today as it was when this car was new. 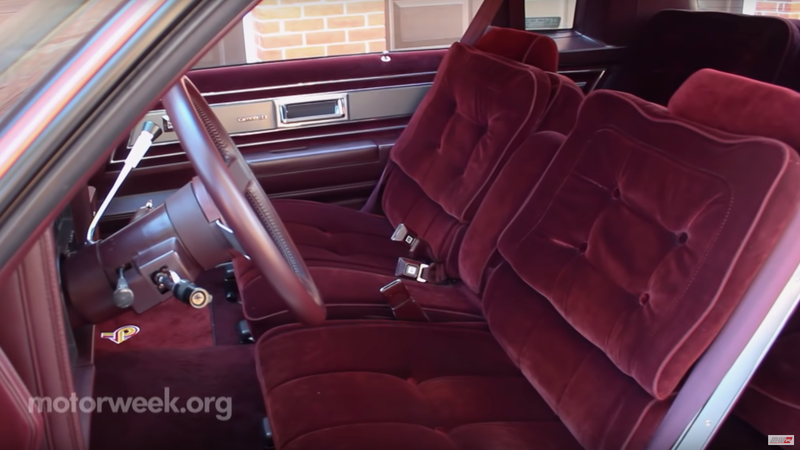 I have to admit I had no idea this car existed until I saw this video, but I’m very excited to have absorbed some more trivia about this Buick’s raddest turbocharged muscle car. Of course, most of us remember the Regal. And just about anybody who’s into cars knows what a Grand National or GNX is. But I bet very few would know what to make of a Limited Turbo like this one. Interestingly, Ligo reports that Limited Turbos are selling for about “30 percent less” than the better-known Grand Nationals. I mean, they’re not as cheap as a regular Regal; if you’re just learning about this car along with me, we’re not the first people to discover them. But if you’re casually car shopping for a fast Buick from the ’80s and haven’t heard of this yet, I guess it’s your lucky day–buy one before the secret spreads any more. Why Does This Dealership Have A Waiting List For Buick Grand Nationals?